Another year, another Call of Duty. And what’s a Call of Duty game without a few zombies? 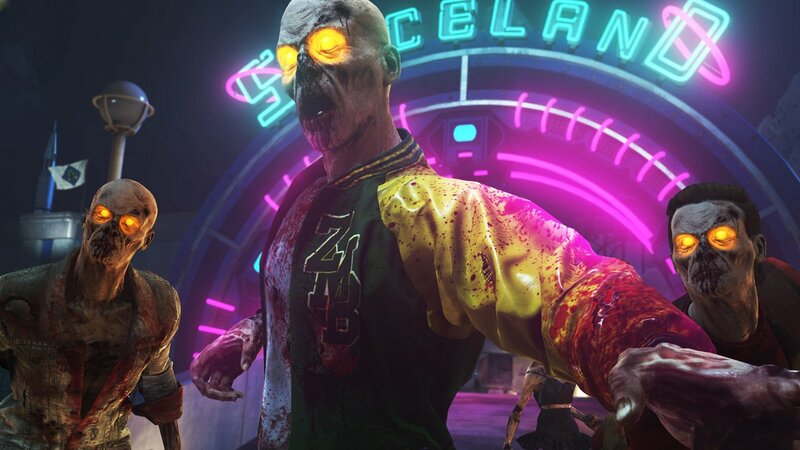 The popular co-op survival mode is getting an 80s-themed makeover in Call of Duty: Infinite Warfare, titled Zombies in Spaceland. Players can play one of four characters, modeled after popular 80s archetypes: nerdy Poindexter(voiced by Seth Green), football jock A.J. (voiced by Ike Barinholtz of The Mindy Project fame), rapper Andre(voiced by SNL alum Jay Pharoah) and valley girl Sally(voiced by SNL cast member Sasheer Zamata). The story follows four aspiring actors who are invited to a mysterious movie theater by director Willard Wyler (played by Paul Rubens of Pee-Wee’s Playhouse fame). The actors are suddenly transformed into the aforementioned characters and must survive waves of the undead in a space-themed amusement park with help from a mysterious DJ, played by ultimate 80s icon David Hasselhoff. A special live stream will happen tomorrow on at 9AM Pacific Call of Duty’s Twitch, YouTube and Facebook channels; where comedian Jay Pharoah will speak with the game’s developers and show off more gameplay. Call of Duty: Infinite Warfare is set to release on November 4th for PlayStation 4, Xbox One, and the PC.